The recommendations for brevets or for honorable mention for such field officers is, in the opinion of the department commander, an insult to the memory of the dead, as well as to the brave men living. In the months following the Battle of Wounded Knee, numerous officers and troopers of the Seventh Cavalry and First Artillery regiments were recommended for awards, brevet promotions, or honorable mention. Thirteen Seventh Cavalry soldiers received the Medal of Honor–the nation’s only official decoration–for their actions at Wounded Knee, four for their actions at Drexel Mission on the White Clay Creek, one for actions in both battles, and two for their conduct during the entire campaign. * Additionally, two soldiers from the First Artillery and one from the Second Artillery–soldiers who manned the Hotchkiss mountain howitzers at Wounded Knee–received the Medal of Honor. Three enlisted 7th Cavalry troopers also received the lesser known president’s Certificate of Merit, an award specifically for gallantry in action. * My numbers for medals awarded to 7th Cavalry soldiers at Wounded Knee and Drexel Mission differs from the official record, as one soldier, Marvin Hillock, was erroneously cited for action at Wounded Knee, despite clearly being recommended for action at White Clay Creek. Most every regular Army officer in the Civil War received at least one brevet promotion, most awarded for meritorious service rather than for gallantry in action. Those officers who could boast of a brevet for gallantry were viewed with greater respect for such distinction. Moreover, each year the Government Printing Office published an Army register in which were listed all officers holding brevet ranks along with the reason for being awarded such distinction. While a brevet rank by 1890 was strictly ceremonial and entitled the holder to no additional pay or assignment at higher positions–a change from earlier years–the officer could be addressed in social circles by his brevet rank. Given the Army’s stagnant seniority-based promotion system, being addressed by a higher brevet rank carried far greater weight by 1890. For an example one need look no further than Major Guy V. Henry of the Ninth Cavalry and Major Samuel M. Whitside of the Seventh Cavalry, both prominent figures during the Sioux Campaign of 1890 – 1891. Henry was awarded five brevet promotions, four during the course of the Civil War and one at the end of the war, all for gallantry in action; his highest being the rank of brigadier general in the U.S. Volunteers. By contrast Whitside was awarded two brevet promotions–captain and major–at the end of the war, both for faithful and meritorious service. For the next twenty-five years Henry was addressed as Colonel–his highest brevet in the regular army–despite having only risen to the regular rank of major. Whitside also had risen to the regular rank of major, and thus, his two brevet ranks by 1890 carried no increased distinction in how he was addressed. (Click to enlarge) Extract of Brevet ranks for Majors Henry and Whitside from the Official Army Register for 1891. To be sure, a Medal of Honor was a hallmark of distinguished service in action for any officer so awarded, but in 1891, a brevet rank for gallantry in the face of the enemy carried greater meaning to the officer corps of the frontier Army. This explains why in 1891 Colonel Forsyth–often addressed by his brevet rank of brigadier general–made no recommendations for Medals of Honor for his officers, but instead recommended brevet promotions. The first soldier from the campaign recommended for any form of recognition was First Lieutenant Ernest A. Garlington when on 2 January 1891, four days after Wounded Knee, Colonel Forsyth submitted a request that Garlington be given a brevet of captain for his gallantry in action. 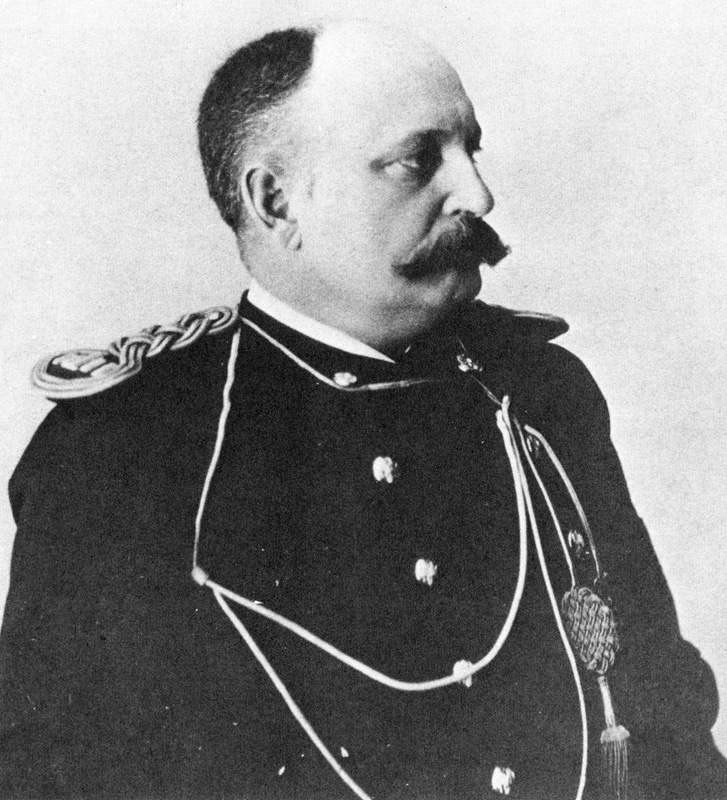 Colonel Forsyth’s recommendations came to a halt when he was relieved on 5 January 1891 pending the outcome of Major General Nelson A. Miles’s investigation of Wounded Knee. Forsyth was reinstated as commander of the 7th Cavalry Regiment on 12 February, and two days later submitted his second recommendation for brevet promotions this time for five of his officers. 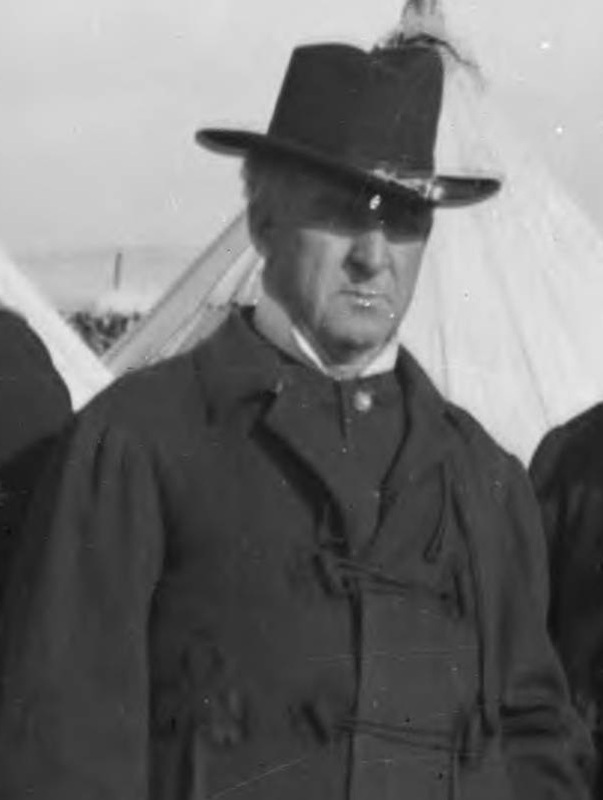 Sir: Referring to the recent Indian troubles in South Dakota, I have the honor to make the following recommendations: That Major S. M. Whitside, 7th Cavalry, be given a brevet of Lieut. 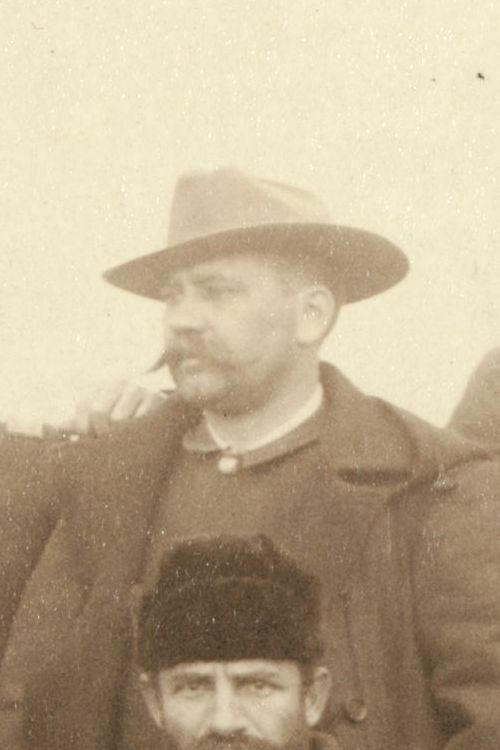 Colonel for the admirable and efficient manner in which he accomplished the capture of Big Foot’s Band of hostile Indians near the Porcupine Butte, South Dakota, December 28, 1890, and his dispositions for the secure retention of the band while returning to his camp on Wounded Knee Creek and until joined by the 2d Battalion of this regiment at about 8:30 P. M. on the same day; and that he be given a brevet of Colonel, for conspicuous gallantry displayed in the battle of Wounded Knee December 29, 1890. That Captain and Assistant Surgeon John Van R. Hoff, Medical Department, be given a brevet of Major for conspicuous bravery and coolness in caring for the killed and wounded in peculiarly dangerous position in the battle of Wounded Knee, South Dakota, December 29th, 1890, and the engagement near Drexel Mission, South Dakota, December 30th, 1890. The circumstances surrounding the performance of his duties by this officer on those two fields of action were such as to force the strongest feeling of admiration for his coolness under fire. That Capt. 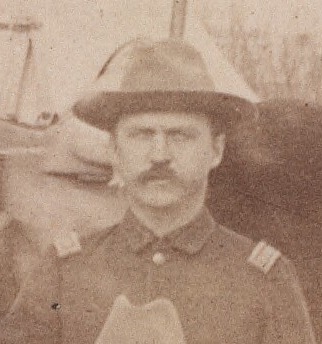 Allyn Capron, 1st Arty., be given a brevet of Major for his conspicuous bravery and coolness in the two engagements of Wounded Knee Creek and Drexel Mission, South Dakota, and for the especially admirable manner in which he handled his command during the two days. 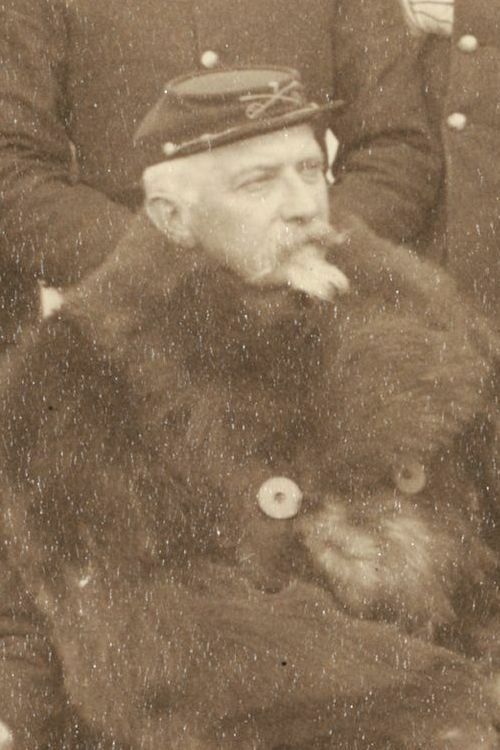 That Captain Charles A. Varnum, 7th Cavalry, be given a brevet of Major, for conspicuously gallant conduct while engaged under fire with the Indians of Big Foot’s band at the battle of Wounded Knee, South Dakota, Dec. 29th, 1890. He was commanding his troop (B), one of the troops used in guarding the warriors, when the fight began. 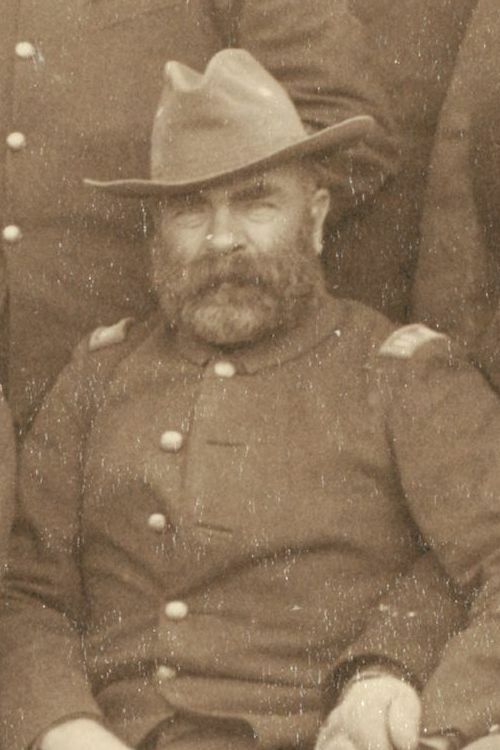 That Captain H. J. Nowlan, 7th Cavalry, be given a brevet of Major for conspicuous coolness and courage under fire in the disposition and management of the men under his charge during the battle of Wounded Knee, South Dakota, December 29th, 1890. On 5 March Colonel Forsyth submitted another letter recommending six officers for honorable mention in orders. I have the honor to recommend the following named officers be mentioned in orders from Headquarters of the Army, for the reasons given opposite each name. 1st Lieut. W. W. Robinson, Jr., 7th Cavalry, for the admirably efficient service rendered by him in organizing the wagon train after the battle of Wounded Knee S.D. Dec. 29, 1890 and taking charge of it during the return night march to Pine Ridge. In this train were the contract teams and wagons which he utilized in transporting the killed and wounded. In the absence of the Regimental Quartermaster Lt. Robinson’s services were especially valuable. 1st Lieut. 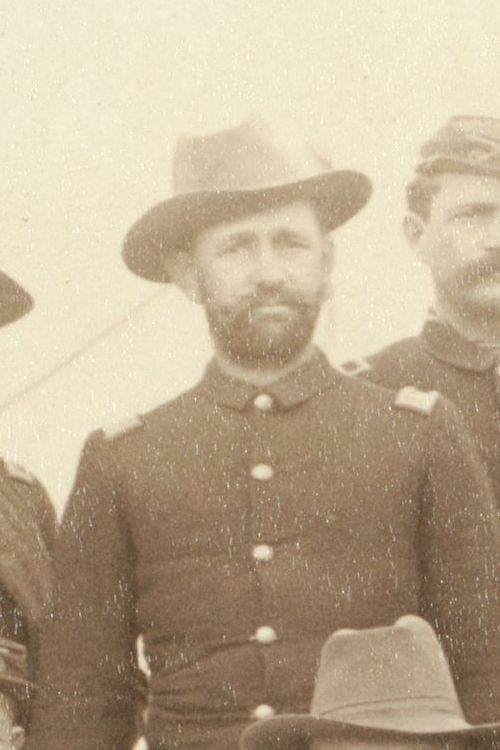 J. C. Gresham, 7th Cavalry, for coolness and gallantry while in charge of a detachment of Troop “B” 7th Cavalry displacing certain hostile Indians from a ravine at the battle of Wounded Knee, S.D. Dec. 29, 1890. 1st Lieut. 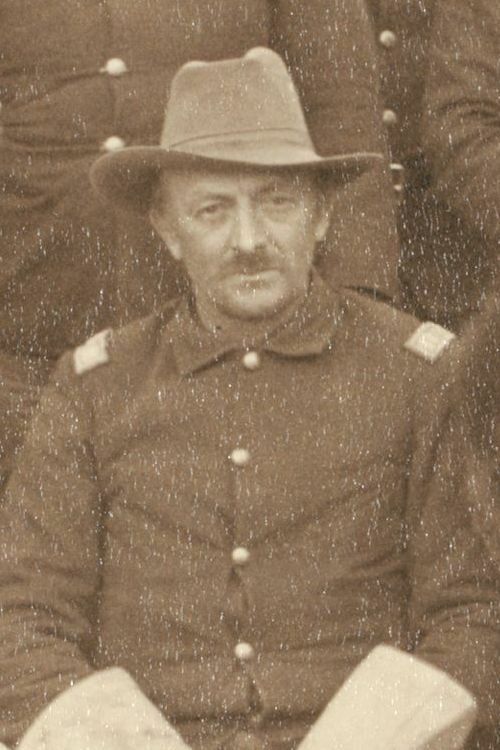 E. P. Brewer, 7th Cavalry, for gallant conduct while on the skirmish line, and while withdrawing under fire during the engagement near Drexel Mission, S.D. Dec. 30, 1890. 2nd Lieut. 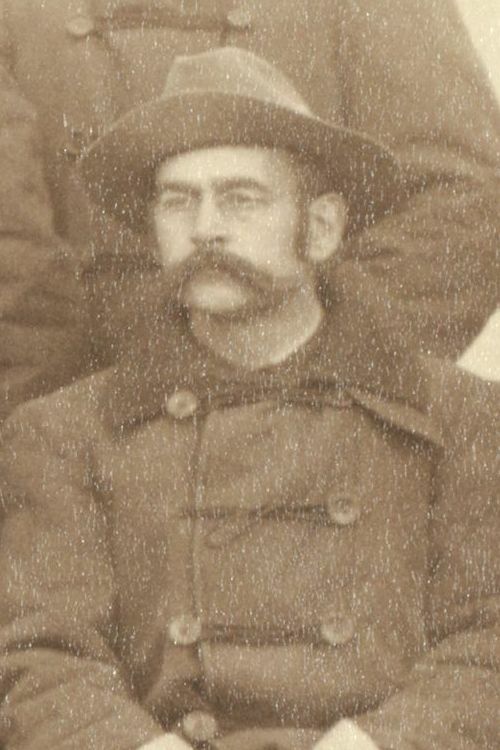 S. R. H. Tompkins, 7th Cavalry, for coolness and good judgment in locating and commanding a small detachment of Troop “D” 7th Cavalry at the head of the ravine to which the Indians retreated at the battle of Wounded Knee, S.D. Dec 29, 1890. 2nd Lieut. Guy H. Preston, 9th Cavalry, for courage and endurance in carrying a dispatch from Wounded Knee battle field to Pine Ridge, S.D. Dec. 29, 1890. Lieut. Preston left the field on this duty before the battle was entirely finished, and at a time when it was more than probable that he would encounter hostile Indians before reaching Pine Ridge. He made the ride of fifteen miles in one hour. The soldier who accompanied him fell from his horse from exhaustion. 1st Lieut. 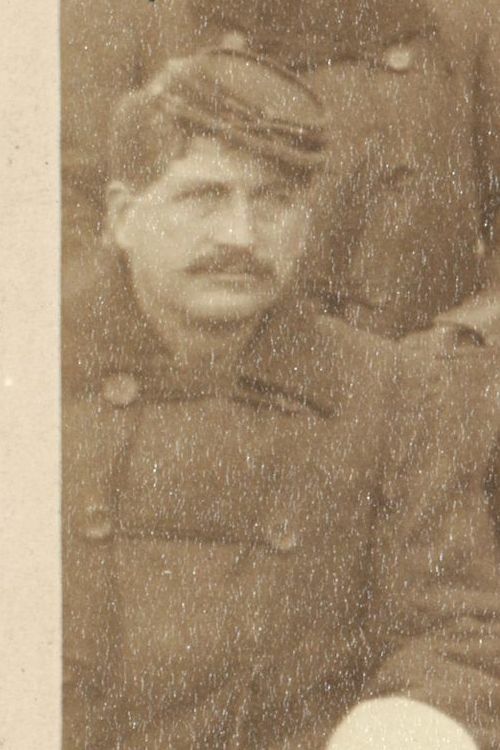 W. J. Nicholson, 7th Cavalry, for energy and endurance displayed in carrying the information of the capture of Big Foot’s band of hostile Indians Dec. 28, 1890. Having accompanied the command to the place of capture–eight miles from camp–he recovered that distance in addition to the sixteen miles to Pine Ridge Agency, and with no rest, returned to camp the same evening with the second battalion. After several months the Adjutant General of the Army referred the recommendations to Brigadier General John R. Brooke, Commander of the Department of the Platte, under whose direct command the 7th Cavalry operated during the campaign. 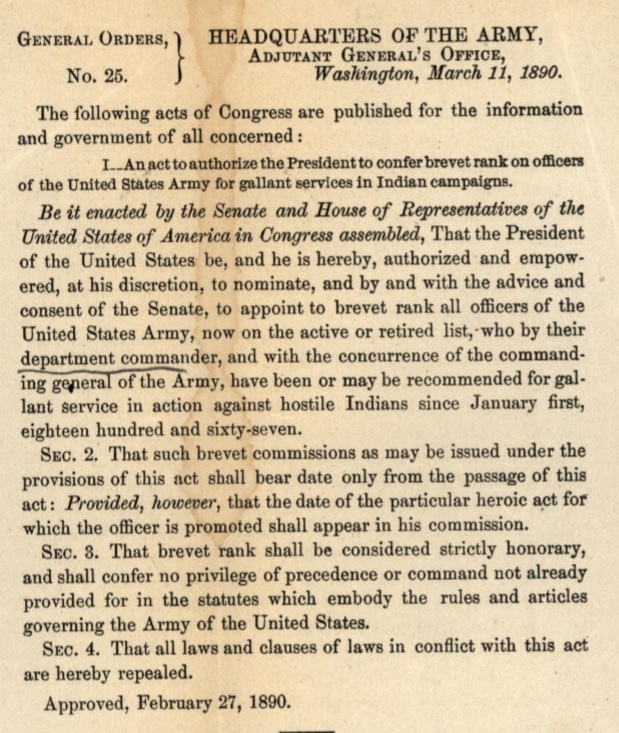 Perhaps realizing that any brevet promotions or honorable mention would be controversial, on 25 September General Brooke demurely endorsed the recommendations writing, “At the time this event took place these troops were under my command but all on the Pine Ridge reservation were within the limits of the Department of Dakota. Because of this I reported to General Ruger and considered myself under his control as Department Commander.” According to the correspondence from General Brooke during the campaign, he never reported to General Ruger, and instead reported directly to General Miles, and General Brooke was keenly aware of General Miles’s visceral and public feelings on the subject of Wounded Knee and Colonel Forsyth. On 2 October Major General John M. Schofield directed that Forsyth’s recommendations be referred to Major General Miles for remark adding that, “The question of brevet is not now under consideration, but only that of honorable mention in orders, and the remarks of Major General Miles, in that connection only, are desired at present.” Miles’s endorsement was appropriate and required not only because as the Commanding General of the Division of the Missiouri all forces during the campaign fell under his command, but more importantly, in October 1891 General Miles was then serving as the Commanding General of the Department of the Missouri and had direct command over Fort Riley and the 7th Cavalry. For brevet promotions army regulation required a Department Commander’s endorsement. General Schofield, certainly under the guidance of Secretary of War Proctor and President Harrison, did not entertain brevet promotions probably because of the certain political upheaval that a mandatory senate confirmation would generate. The president retained the authority to award medals and certificates without involving congress, and the commanding general of the Army could recognize whomever he felt worthy of honorable mention. In forwarding the recommendations to General Miles, the Adjutant General also included the following message concerning Colonel Forsyth. 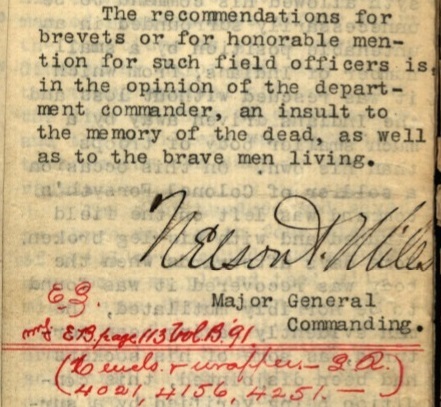 In commenting on a list of officers recommended by Col. Forsyth for brevets, Genl. Merritt, commanding department, calls attention to the claims of Col. Forsyth, commanding the regiment, to the brevet of Major-General, for gallantry at the battle of Wounded Knee Creek, and judicious management in that affair and the subsequent action on White Clay Creek. It is the opinions of many, well capacitated to judge, that but for the indication to the Indians of the terrible results to them further fighting involved at the affair mentioned there might have resulted in the then condition of affairs, a bloody war. Referred to Genl. Miles…. Colonel Forsyth’s brevet recommendations began yet another investigation of the Sioux Campaign of 1890 – 1891, but this one of a very different nature. General Miles had initiated an investigation into Colonel Forsyth’s actions at Wounded Knee and a subsequent investigation into the Drexel Mission fight along the White Clay Creek. As a result of the Wounded Knee investigation, Secretary Proctor directed an investigation into the tragedy at White Horse Creek. Now given the opportunity to remark on Forsyth’s recommendations, Miles saw an opportunity to investigate acts of gallantry, heroism, and fortitude and attached the following endorsement to the Forsyth recommendations. Respectfully referred to Colonel E. M. Heyl, Inspector General, who will visit Fort Riley, Rock Island, Ill., and Fort Sheridan, and ascertain more definitively the conspicuous acts of gallantry, heroism or fortitude performed by the officers within mentioned. During his investigation of all of the circumstances connected with the two affairs, should he find that any officer or soldier has performed acts of especially commendable fortitude or heroism not heretofore mentioned, he will so report, in order that full justice may be done to all concerned. 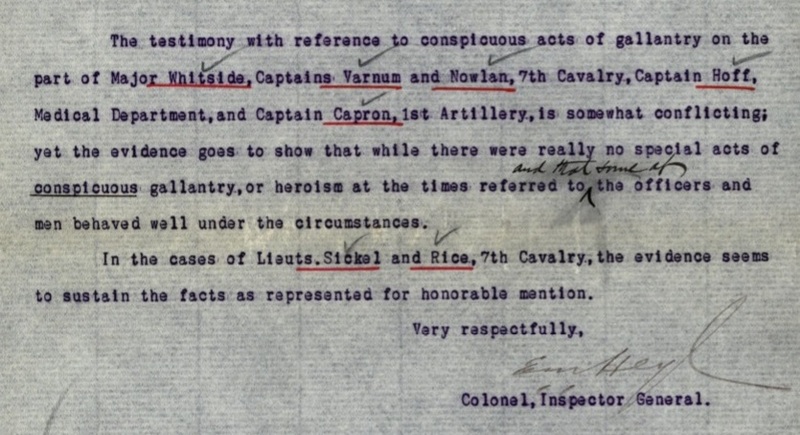 Shortly after the matter of accolades was referred to Colonel Edward M. Heyl for investigation, the Adjutant General’s Office forwarded two more recently received recommendations from Colonel Forsyth for honorable mention of Lieutenants Horatio G. Sickel and Sedgwick Rice, both of Captain Ilsley’s E Troop. Heyl completed his investigation in two weeks and submitted his report to the Department Adjutant General adding a pithy endorsement to Forsyth’s recommendations, “1st endorsement complied with. Report of investigation submitted.” While his endorsement was short and concise, his report was anything but. Chicago, Illinois, October 27th, 1891. Fort Riley, Kansas, October 20th, 1891. Question: Were you present at the surrender and fight with Big Foot’s Band December 29th, 1890? Answer: I was with Major Whitside’s battalion when Big Foot came in, or surrendered. We received orders on the morning of December 28th to saddle up, and marched out of camp about six or seven miles. I saw a body of Indians about one-half mile off displaying a white flag. We dismounted to fight on foot. The Hotchkiss guns were placed in the centre, and the troops on each flank. Big Foot was in a wagon, and Major Whitside went forward to meet him, and after a short talk the Indians were placed under guard and marched back to the 7th Cavalry camp at Wounded Knee. Q: Please state if at any time during the fight at Wounded Knee or Drexel Mission you observed any special acts of conspicuous gallantry, heroism or fortitude, performed by either officers or enlisted men. A: I saw Major Whitside several times. He was on foot directing the movements of part of the command. I cannot specify any special acts of conspicuous gallantry on the part of Major Whitside, but I noticed, particularly, the manner in which he exposed himself to the Indians’ fire. On arriving at Lieut. Sickel’s party to deliver an order, I found Lieut. Rice there trying to encourage the men. Lieut. Gresham rendered me a great deal of assistance while on the line. He was exposed to a very severe fire during the whole time and acted in a very gallant manner. Three men of my troop, “I”, were recommended for acts of gallantry, and have received medals. 1st Sergeant Troutman, Far. Nolan and Sergeant Loyd. Captain Capron’s (Battery E, 1st Artillery) conduct at the Mission fight was conspicuous and cool. I saw him sighting the guns himself as well as directing the fire. I was supporting his battery at the time. I saw Assistant Surgeon Hoff attending to the wounded about the close of the Wounded Knee fight. I saw him at the Mission fight, his conduct was cool and conspicuous and gallant in bringing his ambulance up under a hot fire to attend to some men who were wounded of my troop. He dressed the wounds and helped off the field a wounded man where the fire was very hot on the skirmish line. I noticed Major Whitside at the Mission fight, his conduct was conspicuous throughout. I noticed him particularly as he was in command of my battalion at that time. I belonged to Major Whitside’s battalion at Wounded Knee. At the time the break was made by the Indians I was close to Major Whitside. I was taking the arms from the Indians at the time the break was made. I was separated from Major Whitside the moment the break took place. I had no occasion to, nor did I see him during the fight. I did not notice Dr. Hoff particularly; saw him at Drexel Mission – that’s about all. I did not see Captain Capron, 1st Artillery, at Wounded Knee or Drexel Mission. I saw Lieut. Gresham, 7th Cavalry, go into the ravine (at Wounded Knee) among the wounded Indians, with a pistol in his hand, disarming the dead and wounded Indians. I consider his conduct under the circumstances conspicuous and gallant, as he was liable to be shot at any moment by one of the wounded Indians. Lieut. Gresham also displayed coolness and gallantry at the Mission fight, December 30th, 1890. I consider that Lieut. Rice, 7th Cavalry, is especially entitled to a great deal of credit for the manner in which he handled his detachment at Wounded Knee, under a severe fire from the Indians. Sergeant J. Ward, Troop “B”, 7th Cavalry, for gallantry at Wounded Knee. (medal). Private M. C. Hillock, troop “B”, 7th Cavalry, for gallantry at White Clay Creek. (medal). Corporal H. W. Capron, Troop “B”, 7th Cavalry, for gallantry at Wounded Knee. (certificate of merit). I was battalion adjutant for first battalion (Major Whitside’s) at Wounded Knee, and my duties required me to be at all parts of the line during the fight. All the officers I saw behaved wonderfully well. I saw no particular acts of conspicuous gallantry that I could single out at all. I saw Major Whitside exposing himself as a commanding officer should on the line. I saw Dr. Hoff working with the Wounded, under a very heavy fire. He had several bullet holes through his clothing. I saw Captain Capron, 1st Artillery; he was in an exposed position all the time during the fight, and remained in that position. I saw nothing special in the way of conspicuous gallantry on his part during that time. I saw Captain Varnum, 7th Cavalry, at Drexel Mission December 30th, 1890. He had a small detachment of men at the crest of a hill, and was subject to a very annoying fire on his flank from the Indians. Some of the men (recruits) showed a disposition to seek a place a little in rear. Captain Varnum rushed to the front of the line and ahead of the men and told them they must hold that position at all odds, and stood up in front while the men rallied upon him again, and held the position. I saw Captain Nowlan, Troop “I”, 7th Cavlary, at Drexel Mission December 30th, 1890. He was on the left of the line, and with six or seven men charged the crest of the hill, and dislodged the Indians who were annoying Captain Varnum’s line. I did not observe any acts of conspicuous bravery, heroism or courage on the part of officers at Wounded Knee, December 29th, 1890. I saw Lieutenants Sickel and Rice, 7th Cavalry, move their skirmish lines forward (at Wounded Knee), exposing themselves to a hot fire, when only thirty (30) yards from the Indians in the ravine. These are the only cases where I was particularly impressed with the coolness and gallantry of the officers named. Private Zenhder [sic: Zehnder], Troop “I”, 7th Cavalry, was killed while ripping open a tent in order to get at an Indian who had killed several soldiers. I consider this an act of conspicuous gallantry, as it was almost certain death. The only officer that I know of who has been mentioned for special gallantry, and whose acts were personally known to me, was myself. In the cases of others who have been mentioned, they were entirely unknown to me. No officer was mentioned for conspicuous gallantry, the circumstances of which and the facts attendant which, were known to me. There were no officers at the Mission fight who came under my notice, who displayed special or conspicuous gallantry. I was not in a position to see the whole command, but all were gallant and deserved all praise for their conduct. Q: Please state if you observed any special acts of conspicuous gallantry or heroism on the part of any officers or enlisted men during the engagements at Wounded Knee and Drexel Mission, December 29th and 30th, 1890. A: I saw Captain Edgerly at Wounded Knee December 29th, 1890. During the fire from the Indians, which was very hot, our troop was close to the village and Captain Edgerly was cautioning his men to shoot accurately. I also saw Captain Nowlan, he was in a very conspicuous place, so much so that I sent his sergeant to tell him there were some Indians to his right and rear, that would shoot him. This was during the hottest part of the fight. I saw Colonel Forsyth, and remarked I thought he would be killed every moment. I saw Captains Godfrey and Jackson and Lieut. Donaldson, 7th Cavalry. I also saw Lieutenants Sickel and Rice, 7th Cavalry, who were dislodging some Indians. All these officers were conspicuous in exposing themselves. I saw Dr. Hoff and had to insist upon keeping him away from wounded Indians, as many of them were armed. At the Drexel Mission I saw Dr. Hoff on the skirmish line with ammunition, and heard soldiers on the skirmish line comment on his dash and bravery. I observed Captain Edgerly on three occasions during quite a hot fire, cautioning his men in a very cool and deliberate manner to keep their intervals and fire accurately. I noticed Captain Varnum walking up and down on the skirmish line, bareheaded and under a hot fire, and also observed Lieut. Robinson, 7th Cavalry, place the Hotchkiss gun on the hill, under a hot fire from the Indians. I think that Captain Varnum’s conduct was conspicuous, also Dr. Hoff’s and Captain Edgerly’s. Captain Godfrey, 7th Cavalry, displayed a great deal of coolness at Drexel Mission, walking up and down his skirmish line, and exposed to the Indians’ fire. Q: Did you observe any conspicuous acts of gallantry or heroism on the part of any officer or enlisted man during the engagements at Wounded Knee and Drexel Mission, December 29th and 30th, 1890? A: None with the exception of Captain Capron, 1st Artillery. I was very close to him at Wounded Knee and noticed his actions were cool, that he had not for a moment lost his head. He worked his guns superbly, but no more was done by him than was expected of any other officer. He did his full duty. I had no means of seeing Major Whitside. At Drexel Mission Captain Varnum brought his men back on the line; he was cool and brave. The same remark applies to Lieutenants Rice and Gresham, 7th Cavalry. I only saw Captain Ilsley once or twice at Drexel Mission, and did not see Captains Jackson, Capron or Edgerly. During my observation of Captain Nowlan his conduct was that of a gallant soldier. My answers are formed on the understanding that a conspicuous act of gallantry is something more than the ordinary duty of an officer or enlisted man. Corporal A. Neder, Troop “A”, 7th Cavalry, for gallantry at Wounded Knee, and Private G. Hobday, Troop “A”, for gallantry at Wounded Knee. Q: Please state if you observed any acts of conspicuous gallantry or heroism on the part of officers or enlisted men during the engagements at Wounded Knee and Drexel Mission December 29th and 30th, 1890. A: There were no conspicuous acts of gallantry or heroism that I observed. I noticed several officers under fire who behaved with coolness and bravery, but their acts were not specially conspicuous. They were Nowlan, Lieut. Gresham and Lieut. Brewer. I did not observe Major Whitside. I saw Captains Ilsley and Godfrey and Lieut. Donaldson; they all behaved well throughout the day as far as I saw them. I also wish to metion [sic] Dr. Glennan; he was cool and acted nobly at both Wounded Knee and the Mission fights. Four men received medals: Sergeant E. Hennesse, Private F. Mahoney, 1st Sergeant F. E. Fog [sic: Toy] and Private M. H. Hamilton. A: I saw no cases of conspicuous gallantry at Wounded Knee. The men and officers did their duty. I did not see any other officers during the fight, except Major Whitside, who came over to give me an order, and I did not see any act of conspicuous gallantry on his part at that time. Captain Godfrey, Lieutenants Tompkins and Donaldson were with my command. I did not notice any conspicuous gallantry on their part. I did not see Major Whitside at Drexel Mission. I heard that Dr. Hoff acted very gallantly. No action of any of the officers present at the Mission fight was conspicuous. No enlisted men were mentioned or given medals of my troop. Q: Please state if you observed any acts of conspicuous gallantry on the part of either officers or enlisted men, during the engagements at Wounded Knee and Drexel Mission December 29th and 30th, 1890. A: Lieut. Sickel was in command of Troop “E”, 7th Cavalry, to which I belonged, and immediately after the outbreak at Wounded Knee, our troop was ordered to clear out a ravine in which a party of Indians had taken a strong position in a pocket in the ravine. I think we were engaged there about two hours. Lieut. Sickel, while exercising command of his troop there, was conspicuously brave and gallant in my opinion, by exposing himself unnecessarily to the fire of the Indians and cheering and encouraging his men constantly. Lieut. Hawthorne, 2nd Artillery, when wounded, refused to allow his men to take him off the field, but urged them to work the gun. Lieut. Sickel’s conduct throughout the whole engagement was particularly conspicuous. Lieut. Tompkins was standing up all the time while the men were lying down. His actions during that time were gallant, and conspicuous. I saw Captain Nowlan while we were engaged with the Indians in the ravine. He came up dismounted with an order from Colonel Forsyth, exposing himself to the fire of the Indians all the time. Captain Nowlan stayed with us on the skirmish line until it was withdrawn. I did not notice any special act of gallantry on Captain Capron’s part at the time I saw him. At Drexel Mission in the second position that was occupied by the first battalion, I was ordered with 20 men of E troop to support Captain Varnum. When I arrived on his line, I found that Captain Moylan was in command and reported to him, and was directed to cover an angle on the left of his line where Lieut. Mann had been wounded. Shortly afterwards an order came to withdraw the line from this position. Captain Moylan withdrew his troop. Captain Varnum commenced to retreat, when an assault was made on our line and he found it necessary to retake the former position. Captain Varnum and Lieut. Gresham both sprang forward, leading and cheering their men under a heavy fire from the Indians, retaking the position and driving the Indians back. I thought at that time their conduct was particularly gallant, and that they were conspicuous in their bravery. Private James McDowell, Troop “E”, 7th Cavalry, one of the men in my detachment at the Mission fight, who went to support Captain Varnum’s line, was always exposing himself to the Indians, and was one of the first men to go forward and last to withdraw. This man has not been recommended for honorable mention in orders, or a medal. Q: Please state any acts of special or conspicuous gallantry you may have observed either on the part of officers or enlisted men during the engagements of Wounded Knee and Drexel Mission, December 29th and 30th 1890. A: Captain Godfrey, 7th Cavalry, remained mounted during the whole day, and rode up and down his dismounted skirmish line. He was cool and conspicuous. While I was down at the ravine, Lieuts. Sickel and Rice came over from the village. I consider the bearing of these officers gallant–Lieut. Rice particularly so. Lieut. Sickel was on the skirmish line all the time. These were the only officers who came under my observation during the hot fire. At the Mission fight I noticed Captain Godfrey, who was particularly cool and collected on the skirmish line all the time. I saw Dr. Hoff when he took the ambulance under a heavy fire, with a carbine across his saddle. I saw Dr. Glennan, Assistant Surgeon; he impressed me as being particularly cool and gallant while attending the wounded, both at Wounded Knee and the Mission. Captain Jackson walked across the flat where the fire was heavy, without cover. There was nothing to do but to shoot and nothing to call forth any conspicuous acts, except in the case of Dr. Hoff, that is what came under my observation. I observed Private Holt of Troop “D”, 7th Cavalry; he is an excellent shot, and was very cool and collected during both fights, December 29th and 30th, 1890. No doubt he did some execution. This man has not been recommended to be honorably mentioned in orders. All the enlisted men that came under my observation during both days’ fights are entitled to the highest credit for the manner in which they performed their duty. They were prompt and obedient and showed no signs of fear. Directly under my observation at Wounded Knee during the fight, December 29th, 1890, were Lieuts. Rice and Tompkins, 7th Cavalry. Lieut. Tompkins had charge of a small party of enlisted men, on the other side of the ravine. he was exposed by standing near the edge of the ravine. I did not notice any specially conspicuous acts of gallantry on his part at that time. I did not notice anything particularly conspicuous about Captain Capron’s actions at Wounded Knee. My attention was directed to the ravine. I did not notice any other officers. I was separated from the rest, my field of action being near the pocket of the ravine. Lieut. 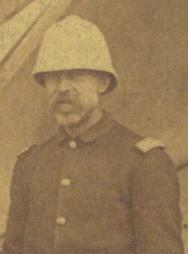 Rice, 7th Cavalry, remained with the gun when Lieut. Hawthorne was wounded, and then took charge of the gun and party. Sergeant Major A. W. McMillin [sic: McMillan], medal for Sioux campaign. Sergeant W. Austin, medal for Sioux campaign. Corporal T. Sullivan, medal for Sioux campaign. Corporal H. Ziegne [sic: Ziegner], medal for Sioux campaign. Sergeant J. F. Tritle, certificate of merit for Wounded Knee. Private M. Flaster [sic: Feaster], medal for Wounded Knee. Dr. Hoff, Assistant Surgeon, came under my observation at Wounded Knee December 29th, 1890, only when he was caring for the wounded, which kept him busy from 15 minutes after the firing commenced until we left the ground. I did not see Dr. Hoff under fire, but the Hospital was within range of the Indians’ fire. No act of conspicuous bravery came under my observations during that time. When the firing first commenced Dr. Hoff was shot through the overcoat, and he told me at that time he had emptied his revolver. I saw Dr. Hoff at the Mission fight frequently, attending to the wounded, and before there was any wounded he was on the firing line in a position of danger. Captain Capron, 1st Artillery, commanded a battery on the side of the hill at Wounded Knee fight, and after the hottest of the firing was over, and the Indians had broken from the square, I observed Captain Capron giving directions to his men to fire on the Indians. He continued giving the necessary orders to his men how to fire their guns, and frequently would sight the guns himself. While engaged in this duty he was shot through the overcoat. His manner was that of a brave and courageous officer. Captain Varnum, 7th Cavalry, at the time of the opening of the fire from the Indians at Wounded Knee, was within six feet of me, searching the Indians for arms. After the firing commenced, it was a sort of hand to hand fight. I consider Captain Varnum’s conduct at that time, both gallant and conspicuous. 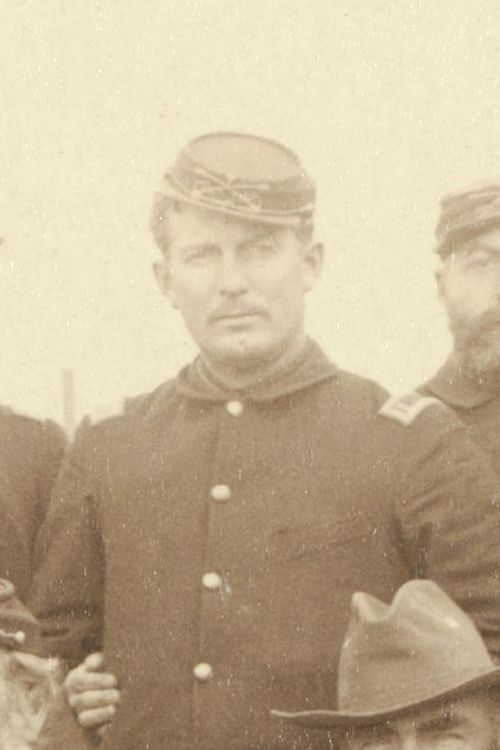 I noticed Captain Nowlan, 7th Cavalry, at a certain stage of the fight. It was reported to me that a number of Indians had passed into a ravine close by. Captain Nowlan had his troop standing on the right of it waiting for orders, dismounted. I directed him to proceed, double time, to the ravine where the Indians were reported to be, and make a thorough search for any Indians that might be there. Although under a fire from another ravine, he moved with the greatest coolness, and gave his orders intelligently and deliberately. He acted as if on parade. His coolness was conspicuous, so much so that he attracted my attention by his conspicuous conduct. Lieut. Nicholson, 7th Cavalry, was in a position of danger all the time. He armed himself with a carbine, and while the Indians were firing on a party of men where he was standing, knelt down and fired at an Indian; the Indian was seen to drop, and his body was afterwards found. Lieut. Nicholson was constantly encouraging the men and directing them how to fire. He was as cool as if at company drill. I observed Lieut. J. C. Gresham, 7th Cavalry. He was under a heavy fire giving orders to his men, and acted in the coolest manner. I regarded his conduct as superb. Lieut. 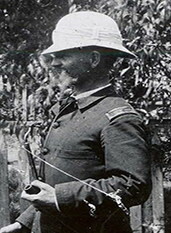 S. Rice, 7th Cavalry, while in command of a number of skirmishers, was attempting to dislodge a party of Indians who had taken refuge in a ravine. He walked from one skirmisher to another instructing them how to fire. The Indians were constantly firing at Lieut. Rice and party. Lieut. Rice never attempted to cover himself, but constantly moved to and fro, encouraging his men, exposing himself to the fire, which act in itself I regarded as conspicuous. The same remarks will apply to Lieutenants Sickel and Tompkins, 7th Cavalry, who had charge of a certain amount of skirmishers endeavoring to dislodge the same party of Indians. I regarded Colonel Forsyth’s conduct conspicuous; he was giving his orders in a very cool and deliberate manner. I did not observe any conspicuous acts of gallantry at the Mission fight, of any one officer more than another, as I did not regard the position of the 7th Cavalry, as in any great danger from the fire. The firing was all at long range. Sergeant B. Jetter, medal for Sioux campaign. 1st Sergeant T. Ragner [sic: Ragnar], medal for White Clay Creek. Trumpeter J. Christenson, medal for Wounded Knee. Private F. George, medal for Wounded Knee. Private N. Fellman, certificate of merit for Wounded Knee. I did not see any conspicuous acts of gallantry or heroism on the part of any officer at Wounded Knee fight. I did not see any conspicuous acts of gallantry on the part of Major Whitside. Dr. Hoff, Assistant Surgeon, performed his duty very faithfully and nobly–nothing conspicuous. He behaved finely. I did not observe any conspicuous acts of gallantry on the part of Captain Capron, 1st Artillery. I was standing near him all the time during the fire. He did his duty. I saw Captain Varnum, 7th Cavalry, a great deal. I did not observe any conspicuous acts of gallantry on his part, any more than the faithful performance of his duty. I did not see Captain Nowlan after the fight commenced. I did not notice anything on the part of any officer, noticeable for any conspicuous acts of gallantry. This refers to Wounded Knee fight, December 29th, 1890. I know of no conspicuous acts of gallantry of any officer at the Mission fight. I was in command of the 2nd battalion. I observed all the officers of my battalion, and while all behaved as officers should–cool, collected and displaying excellent judgment–yet I observed nothing beyond the faithful performance of their duty. I saw Major Whitside most of the time and did not observe any conspicuous acts of gallantry on his part. The dressing station or hospital was in the camp, removed from the scene of the conflict. I was present when the fight opened at Wounded Knee. I went to my ambulance and began to get the wounded out. I was busy dressing them the remainder of the day. I did not notice any acts of conspicuous bravery at the time of the opening of the fight. At the Mission fight I was with the ambulance all the time. I saw Dr. Hoff go through a hot fire to a wounded man. He was particularly cool and collected the entire time. His actions were of a conspicuous nature. I noticed the officers also at the Mission fight, but there was nothing of a conspicuous character in their gallantry; they were doing their duty. I saw a great many officers during the Wounded Knee fight. I was impressed with the gallant bearing of every officer I saw. I was not, after the first break, in a position to notice many of the officers; my duty was to attend the wounded. There was no single act of any one officer which left an impression on my mind at the time as being unusually conspicuous, but all were doing their work so enthusiastically that had it been my pleasure to recommend any brevets, it would have been hard matter for me to discriminate, as every officer seemed more than intent upon the performance of his duty. The same general remarks will also apply to the Mission fight. I saw the officers–saw probably all of them in the course of that day, December 30th, 1890. I saw them on the skirmish line; they were all well in hand themselves, and had their men in hand. So far as my observation is concerned, I did not notice anything unusual in the way of conspicuous gallantry that day. Q: Please state more definitively the acts of conspicuous gallantry, mentioned in your letter of February 14th, 1891, to the Adjutant General, U.S. Army, recommending Major S. M. Whitside, 7th Cavalry, Assistant Surgeon J. 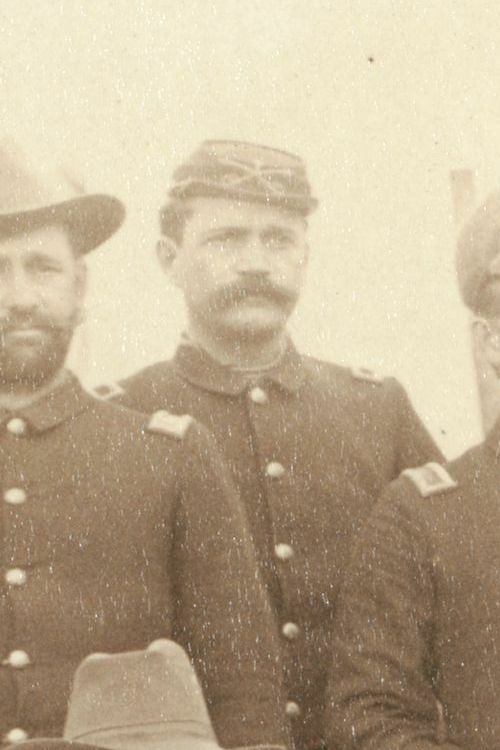 Van R. Hoff, Medical Department, Captain Allyn Capron, 1st Artillery, Captain C. A. Varnum, 7th Cavalry and Captain H. J. Nowlan, 7th Cavalry for brevets? A: The facts are as stated in this and all other letters written, bearing on the subject matter of brevet recommendations. Q: Were these recommendations based upon your own observations, or from reports of others? A: They were based on my knowledge of events that day, my personal observation. Letters were written in the cases of Lieut. 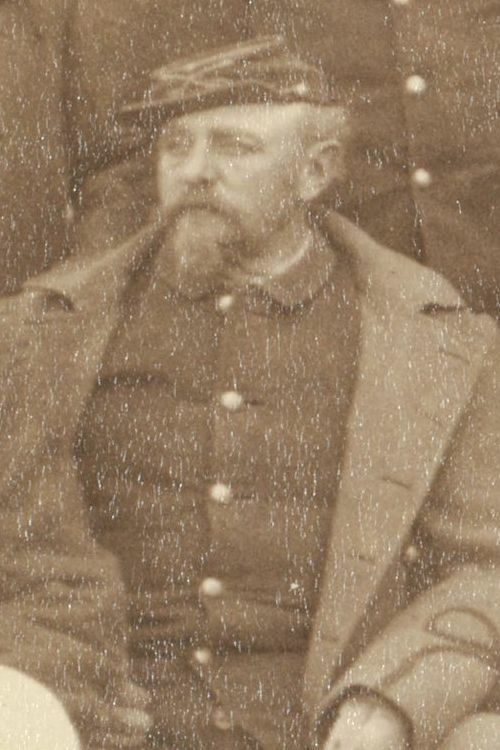 Garlington, 7th Cavalry, Lieut. Hawthorne, 2nd Artillery, in January, 1891, and in the cases of Lieut. Gresham, 7th Cavalry, Lieut. 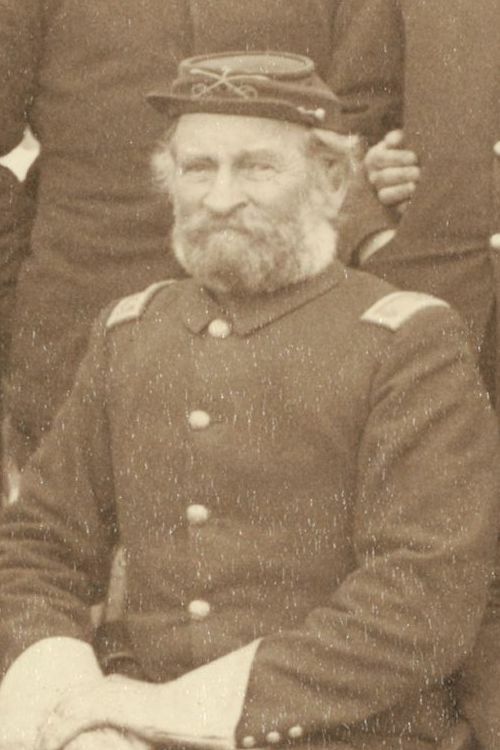 Brewer, 7th Cavalry, Lieut. Tompkins, 7th Cavalry, Lieut. 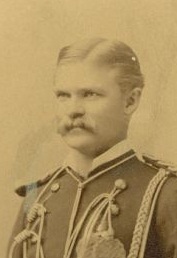 Nicholson, 7th Cavalry, Lieut. Robinson, 7th Cavalry, and Lieut. Preston, 9th Cavalry, March 5th, 1891, for honorable mention. Lieuts. Sickel and Rice, 7th Cavalry, were recommended by me in letter of October 11, 1891, to be mentioned in orders from the War Department. No other cases, to my knowledge, of this character have come to my observation. Privates R. Costner and Girdwood, Hospital Corps, were recommended for medals of honor. ROCK ISLAND, ILLINOIS, October 19, 1891. FORT SHERIDAN, ILLINOIS, October 24, 1891. I left Lieut. Todd, 1st Artillery, at Pine Ridge when we went out to Wounded Knee. He had charge of the 3.2 inch guns left behind, and put his guns in position promptly when a threatened attack was made on the agency. Lieut. Hayden, 1st Artillery, was with Major Henry, 9th Cavalry, on his scout, and at the Mission fight. Major Henry made a report in this case, a copy of which was forwarded to the regimental commander. When we advanced at Drexel Mission (the second day’s fight, December 30th, 1890), I left Sergeant O’Riley, Battery “E”, 1st Artillery, with the 2nd battalion of the 7th Cavalry and moved forward with the first battalion myself. I did not see anything more of Sergeant O’Riley until the 1st battalion was falling back. I was then informed that Sergeant O’Riley had behaved very well there. He was in position and waiting for me. Sergeants Cannon and Donahugh, Battery “E”, 1st Artillery, both had guns at Drexel Mission and Wounded Knee; they behaved coolly and fought their guns well. They were immediately under my supervision, and behaved remarkably well. I recommended Lieut. Hawthorne, 2nd Artillery, for a brevet for his action at Wounded Knee. He gallantly moved his gun forward by hand in order to shell out a party of Indians who had taken refuge in a ravine, and who were picking off our men. In order to get at these Indians, Lieut. Hawthorne repeatedly changed the position of his gun, and kept moving it closer and closer after each fire, in order to get a more favorable position. He fell wounded while performing these acts. On the same day, when the Indians first broke, I had given orders just previous to the break that under no circumstances should a primer be put in a piece–even if the Indians did break–until after our troops had taken such a position as would place them out of the line of fire of the guns. Lieut. Hawthorne stood over his piece and by his coolness and command carried out this order strictly; whereas, if he had fired when the Indians first broke, it would have been with deadly effect upon our men. I did not notice any special acts of conspicuous gallantry of either officers or enlisted men, as my attention was directed to my own command, but at the same time I saw enlisted men repeatedly expose themselves in order to get a better position from which they could fire at the Indians, who were sharpshooting and picking off our men. I was not able to recognize any of these men individually. I would state that I saw Dr. Hoff expose himself, and care for the wounded, time and again, while he was directly under the fire of the Indians. I noticed him particularly. His action at Wounded Knee was conspicuous by the coolness displayed by him in caring for the wounded under the direct fire of the Indians. He set an example that was worthy of emulation of both officers and men. All the officers and men who came under my notice at Wounded Knee did their whole duty. I did not observe any conspicuous acts other than those mentioned. Private John W. Comfort, Battery “E”, 1st Artillery, served with Corporal Donahugh’s detachment at Wounded Knee. Comfort moved a gun up to the relief of Corporal Weinert, Battery “E”, 1st Artillery, under a hot fire from the Indians. At the Drexel Mission fight I did not observe any acts of conspicuous gallantry, but I saw a large number of men and officers act with coolness and deliberation. Lieut. Hayden was not at Wounded Knee. I had four (4) guns at Drexel Mission–Mountain Howitzers. I had six (6) guns in all. Major Henry had two (2). At this point in his report Colonel Heyl inserted three letters written by Captain Capron and one written by Lieutenant Hawthorne. I have omitted these letters and will present them when writing posts on the officers and artillerymen of Light Battery E. Lieutenant Hawthorne’s letter concerned the actions of Musician John Clancy, and following that letter, Heyl noted, “Muscian Clancy has not been recommended for either medal or honorable mention in orders. I consider his action worthy of great praise.” Capron concluded his testimony, “The following named enlisted men of my battery have received medals: Sergerant Paul H. Weinert and Corporal J. B. Hartzog. Privates George Green and John Flood were mentioned in orders.” Colonel Heyl wrapped up his report by addressing the officers specifically mentioned in Colonel Forsyth’s recommendations. Upon reviewing Colonel Heyl’s report, Major General Miles prepared his endorsement of the Forsyth recommendations for return to the Adjutant General of the Army. As with the Wounded Knee and Drexel Mission investigations, Miles had already formed his opinion of the 7th Cavalry’s actions at Wounded Knee, and he paid little attention to the testimony gathered and presented by his inspector general. While Miles seemed impressed with the performance of the captains, lieutenants, sergeants, and privates, he remained convinced that Forsyth’s actions were incompetent at best, and possibly criminal. Miles’s disdain for Colonel Forsyth following Wounded Knee was well known throughout the Army and his blistering conclusions in the Wounded Knee investigation were printed in papers across the country the previous February. However, Miles had yet to opine on Major Whitside’s conduct at Wounded Knee. The department commander’s endorsement of the Forsyth recommendations gave him the opportunity to express his opinion of Whitside and take another shot at Forsyth. Miles held nothing back. Respectfully returned to the Adjutant General of the Army, for the information of the Major General commanding the Army. To commend subordinate officers and soldiers for restraining and withholding their fire in the early part of an engagement, when they, by the orders of their superior officers, had been so placed that their fire would have had “deadly effect” upon their comrades would be somewhat unusual; yet the actions of such officers as Captains Moylan, Capron and Godfrey, and Lieutenants Garlington, Hawthorne, Sickel, and others, did much to retrieve the actions of Major Whitside and Colonel Forsyth, who were responsible for placing and retaining the command in such a fatal position, resulting, in the opinion of the Department Commander, in the useless waste of many lives. Instead of commendation, Major Whitside deserves serious condemnation: First: for camping a body of Indians close to a deep ravine, where they were able to escape, or in case they should take refuge in the ravine cause a useless loss of life in dislodging them. 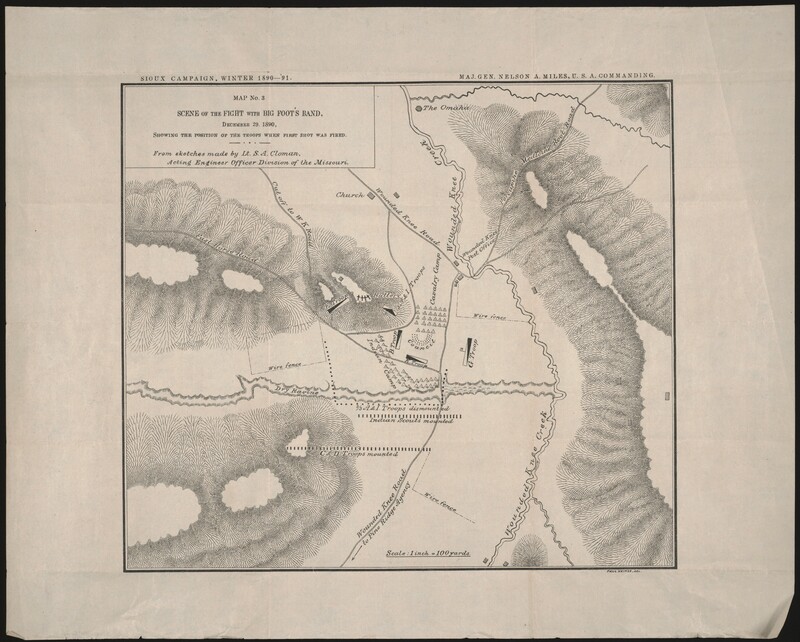 Second: By making so fatal a disposition of his command (reference is had to map of Wounded Knee affair, where the positions as given were indicated by Major Whitside to the topographical officer) that the line of fire of every troop and the artillery was directly towards its own camp or comrades. (Click to enlarge) Lieut. S. A. Cloman’s map of Wounded Knee depicting the scene of the fight with Big Foot’s Band, Dec. 29th 1890. The four hundred and seventy-three men, with four pieces of artillery, could and should have been so placed that all might have fired upon the warriors who did not give up their arms, without endangering the soldiers’ lives or the lives of over two hundred innocent people. In the opinion of the Department Commander, Colonel Forsyth is equally deserving of censure for permitting and continuing such a disposition of his command in the presence of a body of armed Indians. The pretence that no danger was apprehended does not justify any officer in permitting his command to be uselessly jeoprdized. He is also responsible for the way in which his command was handled after the first fire occurred. On the following day, on White Clay Creek, Colonel Forsyth allowed his command to be unnecessarily surrounded in an untenable position by a small number of Indians, from which it was rescued without loss and the Indians driven away by a much smaller body of troops than his own. On this occasion a soldier of Colonel Forsyth’s command was left on the field stunned and with his leg broken. Some days afterwards when the body was recovered, it was found to be horribly mutilated, the man evidently having been tortured, as some of his sockets had been disjointed, this condition being verified by a surgeon. The Indians subsequently admitted that this man was not dead when found by them. An officer of the 7th Cavalry has said that, at the time the troops were retiring, he volunteered to go with a sergeant to recover the soldier, but was not permitted to do so. When Colonel Forsyth’s command retired from White Clay Creek field, leaving one of his soldiers disabled on the field, it consisted, with Major Henry’s command, of twelve troops of cavalry and five pieces of artillery, approximating six hundred men. General Miles concluded his scathing indictment of Colonel Forsyth and Major Whitside by eliminating any thought that the War Department might have had about recognizing the two field grade officers in any manner. The final approved list of officers and enlisted men given honorable mention for services during the Pine Ridge Campaign of November 1890 – January 1891 in General Order 100 on 17 December 1891 and General Order 33 on 16 May 1892 can be found on the Gallantry in Action page of this blog. Absent from the list is any mention of Colonel James W. Forsyth and Major Samuel M. Whitside of the Seventh United States Cavalry. Major General Miles’s endorsement was not publicized and it is probable that neither Forsyth nor Whitside ever knew of Miles’s condemnation. The absence of both officers’ names from any honorable mention did not go unnoticed in Army circles and the public at large. The Omaha Daily Bee picked up on the slight in an article on 30 December 1891, exactly one year after the battle on White Clay Creek. The roll of honor which has recently been published exalts some officers who did not fire a shot at the enemy and others who were not even exposed to the inclemency of the Dakota blizzard. 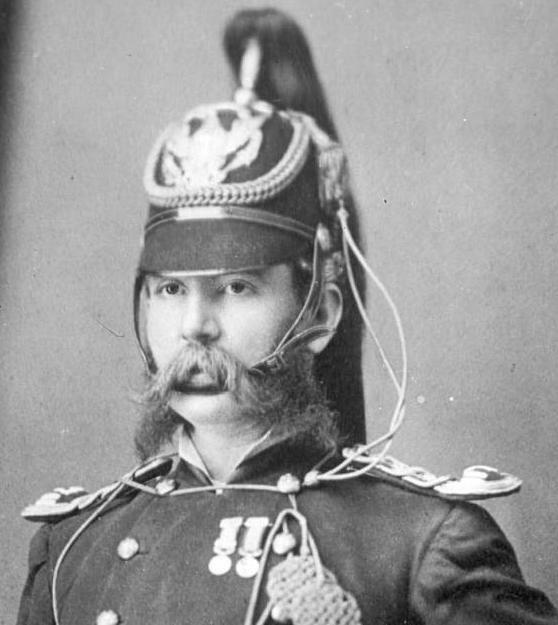 In military circles it is regarded as absurd because of the conspicuous slight put upon such brave officers as Captain E. G. Fechét of the Eighth cavalry, who rescued the Indian police from certain death at the Sitting Bull fight, General Forsyth and Captain Whitesides [sic: Major Whitside] of the Seventh cavalry whose intrepidity prevented further slaughter of the soldiers at Wounded Knee. There are other examples of the manifest partiality of the recent roll of honor, but these are by far the most glaring. The thing is a lamentable farce. The orders announcing this roll of honor tend to bring the whole system of public recognition of military services into ridicule. The brave men who are named in these particular military orders can hardly feel complimented or honored by the distinction, because of the manifest unfairness of singling out for equal honors officers whose conduct was not deserving of special mention. The elements of personal likes and dislikes have apparently entered so extensively into the recommendations upon which the War department has based its action as to lower the value of a military decoration, instead of inspiring men and officers to gallant and meritorious conduct in trying circumstances. Source: Adjutant General’s Office, Medal of Honor, Principal Record Division, file 3466, Record Group: 94, Stack area: 8W3, Row: 7, Compartment 30, Shelf: 2. I am greatly appreciative of the research conducted by Vonnie S. Zullo of The Horse Soldier Research Service. Without her untiring efforts of going through two greatly mishandled folders of thousands of unsorted documents this work would not be possible. With the exception of one reference and extract from the Official Army Register for March 1891 and an excerpt from the Omaha Daily Bee, Omaha, Neb., 30 Dec 1891, all references came from the Medal of Honor file researched by Vonnie Zullo. 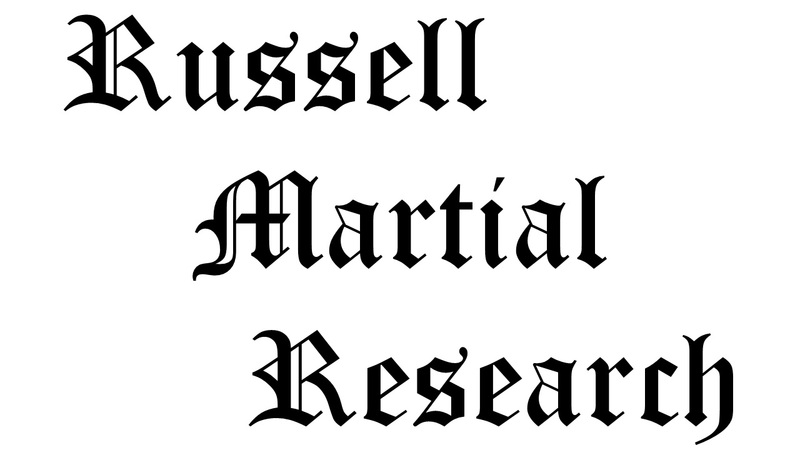 Citation for this article: Samuel L. Russell, “Investigation of Acts of Gallantry, Heroism, or Fortitude,” Army at Wounded Knee (Sumter, SC: Russell Martial Research, 2013-2015, http://wp.me/p3NoJy-yK), posted 16 Nov 2014, accessed date __________. This entry was posted in Award Recipients, Officers, Official Reports, Wounded Knee Investigation and tagged 7th Cavalry, 7th Cavalry Regiment (United States), Battle of Wounded Knee, Big Foot, Brevet, Cavalry, Cavalry Troop, Dakotas, Department of the Missouri, Department of the Platte, Drexel Mission, Forsyth, Fort Riley, Godfrey, James Forsyth, John Gresham, John R. Brooke, Medal of Honor, Military Investigation, Myles Moylan, Nelson A. Miles, Pine Ridge, Pine Ridge Agency, Pine Ridge Campaign, Pine Ridge Indian Reservation, Samuel Whitside, Sioux, Sioux Campaign, White Clay Creek, whitside, Wounded Knee, Wounded Knee Creek, Wounded Knee Massacre. Bookmark the permalink.